Responding to leads within 1 min. is proven to increase your lead conversion by 391%. Ideally, you can answer all of your inbound leads from calls, email and text messages within 5 mins. but there are times when that is not possible. This is where CallAction Drip Campaign is your solution. A virtual ISA based on SaaS software. 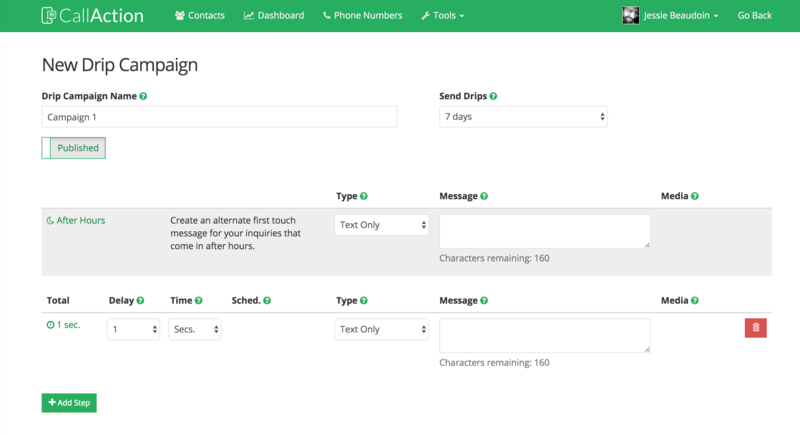 Get started by first familiarizing yourself with the CallAction drip campaign interface. Now we will show you how to quickly and easily build a lead follow-up drip campaign. We recommend that you write out your drip campaign first. Review your drip campaign cadence (frequency) and messaging. Write out your voicemail message drops that you will be sending and practice them out-loud so they sound natural. Use the final draft as your guide to efficiently create your campaigns. Next, access your media library to upload content to be used in your automated drip campaigns. Image Files: upload any images to be used in your campaigns. Enter a descriptive "Drip Campaign Name"
After Hours: This an alternate first message that is sent if your lead was received after hours. You can personalize this to say... "Hi, I'm following up regarding your email inquiry late yesterday"
Delay: Select the increment of time to send the first message from the moment it is received. Time: Select the unit of time to send a message. Sched. : If you select a scheduled time, select the exact time you want to send the message. This is useful for voicemail messages as you can reference the call time to make it seem more natural. Type: Select the type of message to send. You have 7 different types of messages that can be sent. Message: Enter your text message body. The system will show you the length of the message and if will be broken up into more than 1 message. You may use also use emojis. Media: Click "Media" to select your audio, image or video attachment. You have now built the first step of your drip campaign. Simply repeat the steps above to build out your complete nurture campaign. When a lead responds to your campaign, the system will automatically stop the current drip campaign. You may also manually stop any drip campaign in the contact record. If a lead responds with a text like "Stop" system will automatically put lead into a "Do Not Contact" status so you don't assign another automated campaign by accident. After you have engaged the lead, you may re-assign a new drip campaign that will start automatically based on your initial delay. As an example: Build a campaign to follow-up with a lead in 1 month. Set your delay to "1" and time to "month". That new drip will start in 1 month from the date & time you reassign the new drip. This can be done directly in your mobile interface or desktop in real-time. When a user responds to a drip campaign, we send you text notification with the 🔥 emoji to identify this hot lead, so you'll know to immediately engage this double-opt in lead. View your lead engagement rates of each of your drip campaigns with our dashboard. You may also copy existing campaigns to perform A/B testing in the Drip Campaign dashboard. If you currently do any kind of offline or online marketing you can immediately increase your lead conversion with the CallAction Drip Campaign solution. We offer a free 14-day trial of the platform. Setup Your Trial in 10 Mins.